We all have lots of fears but generally speaking the thing we fear most is suffering - either from social rejection, illness, poverty, and ultimately, death. Our fear of suffering is implicit in everything we do. Buddha recognized that we’re not very good at managing our suffering. He recognized that we fear suffering but we don't fear the causes of suffering. In Buddhist practice we distinguish between useful and useless fears. A useful fear would be to fear the causes of your suffering i.e. just as you fear being sick and take appropriate steps to make sure you don't fall ill, so you need to fear your delusions so as not allow them to spread dis-ease throughout your mind. The root cause of all of our suffering is our ignorance of how things/life exists, along with anger, desirous attachment and all the other states of mind that cause us suffering and pain. Because of ignorance, we mistakenly think life occurs outside - instead of inside - our minds; and we blame our suffering and problems on other people, the weather, the government etc. Buddha was so kind; he pointed out to us the actual causes of our suffering and how to permanently eliminate those causes from our mind. To get rid of our suffering, we need to get rid of our delusions, like anger, anxiety etc. With a distorted mindset, we perform various kinds of action, which in turn give rise to a corresponding effect. Karma means action and is the law of cause and effect. When we act with a kind-hearted, helpful intention we sow the karma to experience happiness; and when we act a with hurtful, negative intention we sow karma of unhappiness and suffering. For example, one of our favorite past times is divisive speech. We rehearse sarcastic quips or fire back at people who’ve disagreed with us. We create a habit of saying hurtful things, and people get trapped in a cycle of both hearing and saying harmful speech. This harmful, painful cycle is the result of engaging in divisive, hurtful speech over and over again. This shows how we create habits of outcomes we really don’t want. As a result, people end up finding themselves surrounded by others targeting them with negative, critical comments. Even if someone were to say something helpful to us, because of the karma of hurtful speech we have created in the past we can even perceive the helpful, loving, beneficial advice we receive from others as hurtful and/or demeaning. All of this is happening within our field-like mind. Buddha used the metaphor of a gardener to help us understand the law of karma. In this metaphor we are the gardener, our mind is like a field and our actions are the seeds we sow in that field - some seeds/actions are good and some seeds/actions are poisonous. A wise gardener, who understands the law of karma, will only sow medicinal seeds in the garden of their mind. Implicitly, karma asks us to be responsible for our actions. Therefore, no one but you has the responsibility of how you perceive and respond to your karma ripening. For example, is sickness positive or negative karma ripening? It depends on how we respond to it. Normally we would think that it is some negative karma ripening. But that is not so. To the skillful gardener sickness can be seen as a purification or as a way of deepening their compassion, connecting their hearts to others who suffer from sickness etc. If we are a skillful gardener we can see all of our ripening karma as useful and as a way to deepen our spiritual understanding. To be sure, karma is not a form of punishment from a past life or to suggest that when something wrong happens to you, that you’re a loser and deserve it. Karma is more akin to when you crash your car that you first realize that you are at the wheel determining your experience moment-by-moment. At times, we can often be a crazy gardener when we ignore our role in creating our present circumstances. We ask, ‘where did all of these weeds/painful situations in my garden/life come from?’ when it was us who has been creating the conditions in our very own garden all along. So if you have family problems, financial difficulties, relationship issues, ask yourself, “Who created this?” You did. Use karma as a mirror to show you what you’ve caused, what you need to handle, and what you need to uproot. Otherwise, you will feel like a victim - or worse yet, blame it on your mother! If you want to know what your future will be like, just look at your current state of mind. It’s both your intention and your action where karma sows the seeds of your future experiences, in this or the next life. So ask yourself, “What state of mind do I want to have in 10 years?” If left unchecked, your mind and actions of say, writing nasty emails or grasping at possessions will only create a very difficult experience for you in the future. On the upside, at the moment we all have some AMAZING good karma ripening from our previous well-intentioned actions, such as our opportunity and access to study Buddha’s teachings, share the Dharma, and find community in a Sangha. Always relate to your potential and think of yourself as a good karma gardener. You have sown some fantastic karmic seeds of compassion, patience, and love and those are ripening now as many of the fortunate conditions you currently enjoy. Nice Job! When your mind is completely pure, you will experience a pure world, surrounded by pure friends, whilst enjoying everything as pure. In particular, when you purify your mind of the ignorance that perceives yourself as limited, fixed, stuck, hopeless, eventually what you experience will be your pure heart, your Buddha nature, your potential for boundless freedom and the fulfillment of all your wishes. Make the teachings on karma practical for you right now and ask yourself, "Do I like the seeds I am planting in my mind via my thoughts and actions? Are my actions creating happiness or suffering for myself and others?" If not, then take the appropriate steps to change your actions. First, accept the conditions of your 'field-like mind,’ such as, the metaphoric stones, weeds, and thorns / attachment to things going your way all the time, hot tempered reactions to stressful situations, harmful habits like hurtful speech, gossip, unkind thoughts etc. Second, develop the desire to not create further poisonous seeds in your field. In other words, having identified those mental habits you'd like to change, decide you are going to refrain from such actions so as not to create negative karma for yourself and others in the future. Third, enjoy acting in virtuous, kind-hearted, loving, helpful, beneficial ways sowing positive seeds in your mind that will ripen as the delicious fruit of future happiness! PS: This needs repeating: please don't use karma to feel bad about your circumstances. It's up to you to work with your karma happily and skillfully, creating the life you want. When suffering arises be happy, and respond with peace and acceptance. What Geshe la says. . .
Click to download the free e-book version. 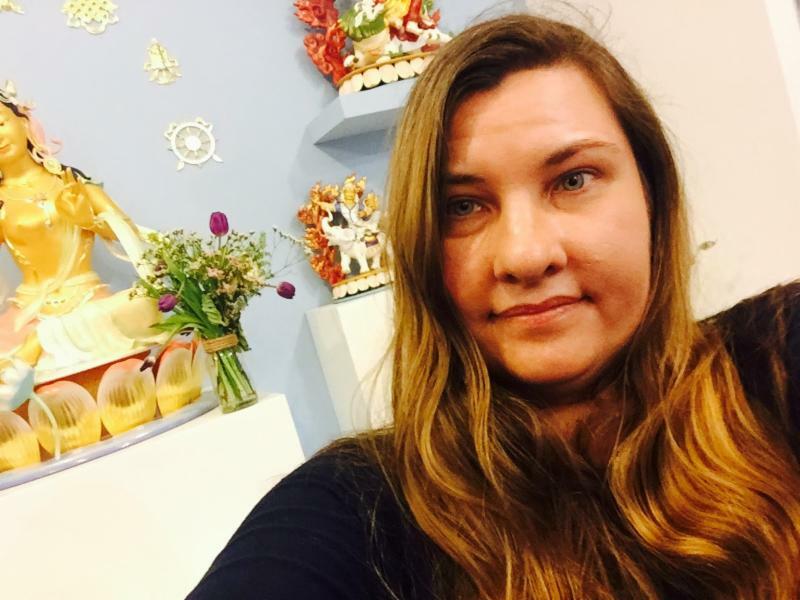 Teri P. shares her story of attending classes both in the Williamsburg and Manhattan branches: “I started coming to mediation seven years ago when I found out that my father had terminal cancer. I was totally freaking out and had so much fear and anxiety. After starting a daily meditation practice, I was able to accept that I had no control over what was happening and I was able to enjoy the time I had left with him. Surprisingly, I have many beautiful memories from when he was dying. Teri checks in students on Wednesday nights. Be sure to say hello! Upload Your Story & 'No Selfie' Today. Click here to share this pearl of wisdom from Geshe la on Facebook. To follow the path to enlightenment there is no need to change our external lifestyle. We do not need to abandon our family, friends or enjoyments, and retire to a mountain cave. All we need to do is change the object of our cherishing. Until now we have cherished ourself above all others, and for as long as we continue to do this our suffering will never end. However, if we learn to cherish all beings more than ourself we will soon enjoy the bliss of enlightenment. The path to enlightenment is really very simple—all we need to do is stop cherishing ourself and learn to cherish others. Share this graphic and the Dharma in Your Newsfeed. Enjoy COFFEE TEA & CHAT after Sunday meditation class. Get your Dharma on and come to class! Please arrive 10-15 minutes early to check in and get settled. We unfortunately cannot accommodate late arrivals because our volunteer receptionists participate in the class. The directions are below. Read More About the Class Series & Topics.